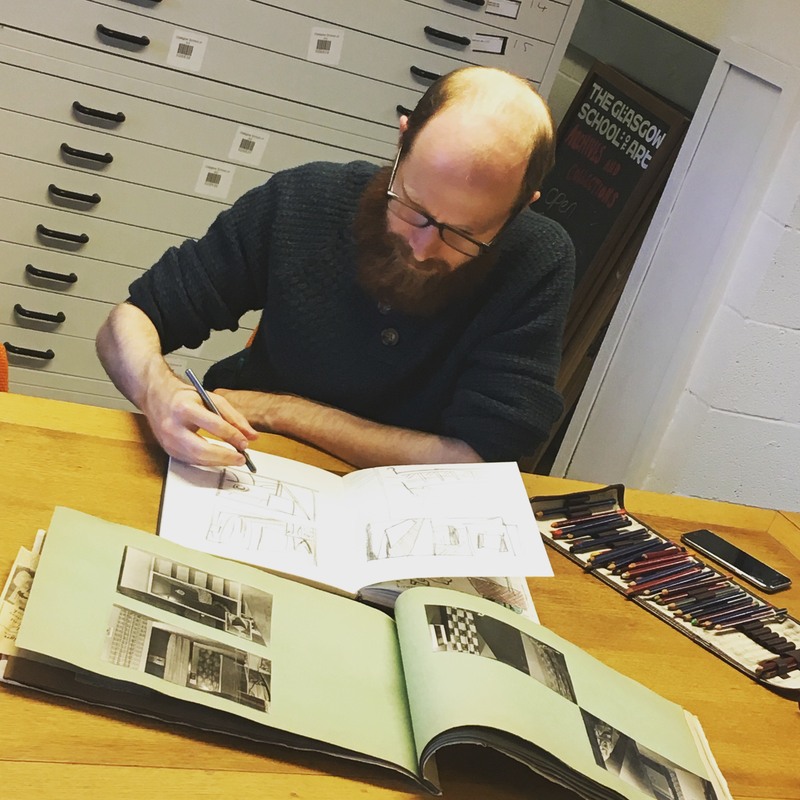 Recently we welcomed Artist and Archivist Peter Morphew to the GSA Archives and Collections to sketch some of the records! He wrote a fascinating blog-post following his visit and has kindly allowed us to re-blog his piece! For my latest edition of #archivedwalks , I decided to visit the Glasgow School of Art archive. Using search terms collage, sketchbook and scrapbook on the online catalogue. I located the records of John Walter Lindsay. It is hard to write why I chose these records because there really was no pre-defined reason. Most archivists’ expect researchers to make an appointment and to engage with the records data for various research projects. It is rarer to have individuals visiting merely because of curiosity. My purpose was to liven up my arts practice. I was not sure what to expect or if I would find anything to stir a creative project. The archives contacted me to approve access, but a warning that no photography was permitted due to these being orphan records. In short, the current copyright owner and source material used within the volumes is unknown. Therefore publishing content from the records is not permitted. I was delighted to learn this since I absolutely hate photographing archive records, as a society we spend so much time trying to document (literally) everything without spending time engaging with the information on display. My first impressions of the GSA archive search room was simply delight, I was surrounded by a stunning creative environment. The walls were decorated with pictures, bookcases of all shapes and sizes containing many marvellous art books, there were many busts topping the shelves and a selection of free badges (everyone loves the badges). I started to flick through John’s travel journals and spent a total of three hours drawing from them. I realised his creative interest was exploring the use of space. Several photographs showed a winding staircase leaving an empty yet full abstract form. John made a drawing of Milano using a ruler, breaking down the activity of a three dimensioned world into a flat layered two dimensions. Critically though it was the use of collage to draw which sparked a significant creative moment for me. Describing his collage drawing is difficult; the composition was formed using text from a magazine page cut into small pieces. The text was then was over layered by black lines which created an outline, giving the composition a form. He was using the found everyday paper resources to build images. Even the way he curated the journals is critical, on green paper the photographs and drawings were layered in specific spots exploring the space within the page. Reflecting on my own practice I realised I have spent too much time trying to be authentic to archival records. An example being the Anchor Line paper collages. I cut the letters trying to represent the actual typography from a poster. I can argue I have represented the information from the source reliably and the composition has a natural sharpness. But it misses my own individuality. My favourite advice for collage artists is to always be brave enough to destroy your best work, and so I took apart one of the posters and wrapped text from the a children’s Britannica Encyclopedia book. I layered the text around the blue paper in a frame like effect. This calmed the sharpness of the piece significantly. Since then I went a bit mad and have built 18 collage pieces using this new technique. The archivist side of me wanted to create a “series” of work, where the art could be placed within an archival catalogue with a complete administrative history, related materials section. I wanted a body of work about the experience of visiting the GSA archive. What I did not expect was to expand my horizons as to how I can work with collage practice, to be playing with shapes and new cutting techniques that enhance the quality of my work. I still don’t know anything about John Walter Lindsay other than he was a student at the school and later became an interior designer. Part of me doesn’t want to know anything more? It can be a personal humbling experience to be able to flick through another person’s sketchbooks, to see their visual thoughts and experience the world through their documentation. In the end these 18 collages are significant body of work because of the mixture of influences. The compositions exploring the records held at the University of Glasgow are from my #archivedwalks through their archives. But these are now being explored through the influence of exposure from a #archivedwalks at the Glasgow School of Arts archive. The Intersubjectivity of these relationships is worthy of further research into 2018. Reblogged, with thanks, from Peter’s own blog-site: Artist/Archivist.